The article will be using the Express application generator, which can be installed via the npm command. Now you’ll be able to set up an Expressjs application. Head to a directory on your computer that will contain your project and run the below. You should now have Expressjs files and folders set up in the “myapp” directory. Open up the app.js file and add the following code near the bottom of the file. When the application starts running, it’ll listen on port 3000 for connections. If you haven’t installed any node modules, you’ll more than likely comes across errors when your application looks for modules that currently don’t exist i.e. Cannot find module ‘express’. To rectify these errors, you can install the modules via npm within your current working directory. If you then re-run the app.js, you should see the following. You can then head to your browser and type in localhost:3000 in the address bar to view your application. You may get presented with the following. To resolve this error, simply install the jade module. Re-run your application by executing the ‘node app.js’ command, head to the browser and you should see the following. Congratulations! 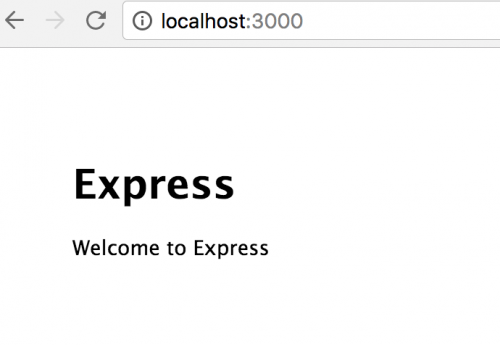 You are now running your own node server using the Expressjs framework.